Game of Thrones stars set to star in 'Carpool Karaoke'! 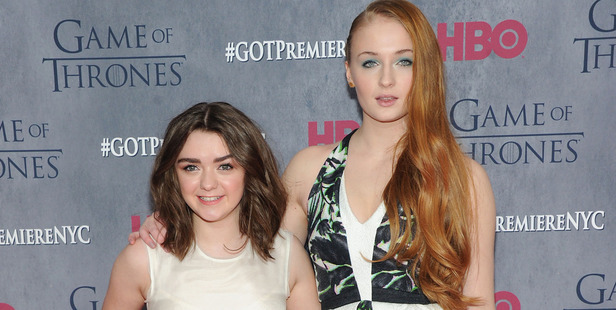 Maisie Williams and Sophie Turner will star in Apple's Carpool Karaoke - the spin-off to James Corden's iconic Carpool Karaoke. The Game of Thrones actresses - who play Arya and Sansa Stark in the fantasy TV series - took to the show's Twitter page to share a video of them filming an upcoming episode. They said: "Hey, Sophie and Maisie. Or Maisie and Sophie. And we're at SXSW. and we're about to do Carpool Karaoke for Apple Music!" And a message on the show's account said: "STARKpool Karaoke? Lane of [email protected] and @Maisie_Williams from @GameOfThrones are shooting a #CarpoolKaraoke for @applemusic! (sic)." YUSSSS we can't wait to see these cuties!! !